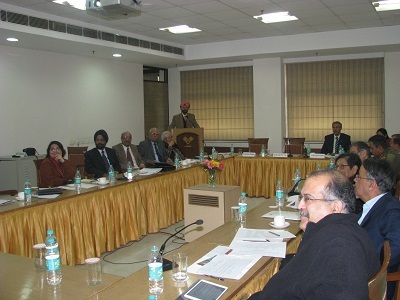 A Round-Table Discussion to deliberate upon the credibility of India’s Nuclear Deterrence especially in the light of Pakistan’s development of Tactical Nuclear Weapons (TNWs) was held at the VIF on 18 November 2013. 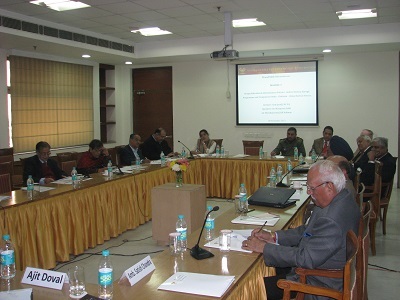 The discussion was chaired by Gen NC Vij, former Chief of Army Staff. The participants included members of the strategic community comprising former diplomats, military personnel and representatives from think tanks. Mr AK Doval, KC, Director VIF opened the discussion by stating that the building up of India’s nuclear capabilities was largely due to its scientists and a few enlightened civil servants who had the vision to allow the former to go ahead with their work in an unfettered manner. The final decision to go nuclear was due to a number of factors and the credibility of India’s nuclear deterrence would be further enhanced with operationalisation of India’s submarine borne nuclear missiles. He underlined the importance of close integration of all the stakeholders viz the developers – scientists, decision makers – Nuclear Command Authority, and the users – Armed Forces, coupled with the constant upgradation of our nuclear arsenal for ensuring the efficacy of India’s nuclear command and control apparatus. He concluded that while nuclear weapons may have prevented full scale wars they had not reduced the scope of limited conflict and covert actions by countries inimical to us. In his initial remarks, Gen Vij dwelt upon some features of India’s Nuclear Doctrine notably credible minimum deterrence, no first use and massive retaliation if deterrence fails. He indicated that Pakistan had gone nuclear and now developed tactical nuclear weapons (TNWs) because of the widening conventional asymmetry with India. It also believed that under the cover of nuclear weapons it could calibrate the use of non-state actors without inviting a punitive military response from India. Therefore, the aim of Indian policymakers should be to find effective means to signal the credibility of its nuclear doctrine without falling for the bogey of nuclear blackmail. The adoption of TNWs is not a new strategy by Pakistan. Even during the Cold War, the Soviet Union and US had graduated to a flexible approach entailing the use of TNWs. Manpreet Sethi of Centre for Air Power Studies (CAPS) stated that the size of India’s nuclear arsenal, its delivery vectors, command and control system, decision making process etc lends immense credibility to India’s nuclear doctrine. The size of the arsenal and a declaratory no first use policy enhances credibility of India’s nuclear deterrence and limits the possibility of nuclear strike against it as the costs on the adversary would be too prohibitive. Air Marshal K K Nohwar recalled the successful conduct of Exercise Poorna Vijay by the Indian Armed Forces in May 2001 which validated the theory that there was space for conventional war even under a nuclear overhang. In his presentation, Air Marshal Nohwar provided figures for the number of nuclear weapons and delivery systems held by the US, Russia, China, India and Pakistan. The development of Arihant SSBN would further enhance India’s strategic depth and dissuade Pakistan from launching a first strike, he said. Ambassador Satish Chandra detailed the main features of India’s nuclear doctrine and the circumstances under which it was formulated. India had no choice but to conduct nuclear tests as Asia was awash with nuclear weapons and as there was blatant Sino- Pak nuclear collusion. India’s nuclear doctrine was formulated in restrained terms in keeping with its traditional behaviour as a mature and responsible state. The term “credible minimum deterrent” signalled that India’s nuclear weapons program was modest and defensive in nature. The concepts of “No first use” and “Non use” of nuclear weapons against non nuclear weapon states lent credence to India’s non threatening posture. The commitment to civilian control, to eschewing exports which could contribute to proliferation and to a continuity of its traditional approach to nuclear disarmament was reflective of its being a responsible state. It would encourage foreign interference. Brig Gurmeet Kanwal expressed doubts whether Pakistan has actually been successful in miniaturizing the Nasr based TNWs or are they simply a showcase weapon. Even if Pakistan is successful in fielding TNWs, given their low yield, such weapons will have a very limited damage potential. Brig Kanwal advocated that future wars would be limited but the Armed Forces must remain prepared for the full spectrum of conflict. Various scenarios of conflict under a nuclear shadow were discussed. There was unanimous view among the participants that the capability or credibility of India’s nuclear doctrine is not in doubt but we must enhance our means to effectively signal the same to our adversaries.